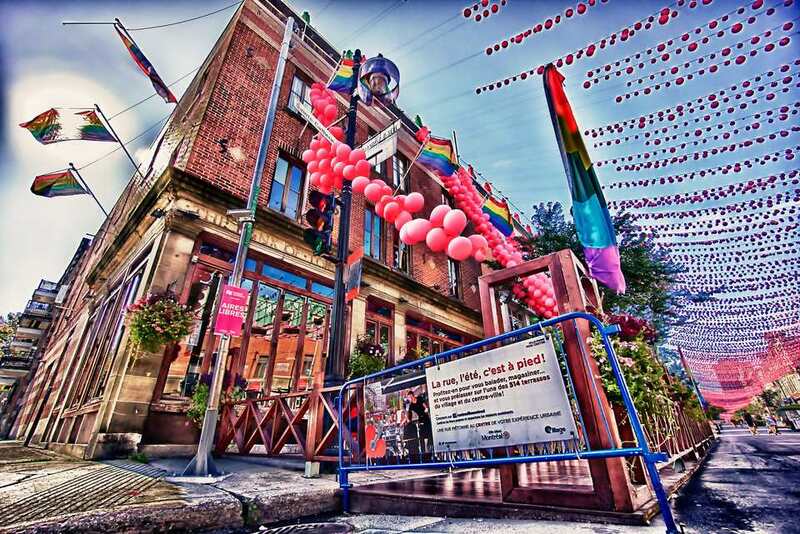 Every spring and summer, the Montreal Gay Village undergoes a transformation. Its main thoroughfare, Sainte-Catherine Street, shuts down to car traffic, making room for the neighborhood to come alive with free art exhibits, street sales, performances, and spontaneous busking action. And, like clockwork, Gay Village restaurants and bars flood the concrete with terraces. Keep reading for a breakdown of this summer's top events. The Montreal Gay Village's busiest thoroughfare, Sainte-Catherine Street, first went car-free for an entire season in spring and summer 2008. It was a hit with tourists and locals—so much so that the pedestrianization of the Gay Village became a summer norm every year thereafter. In 2018, the Montreal Gay Village goes pedestrian from May 3 to September 24, 2018. The entirety of Sainte-Catherine Street East, from St. Hubert to Papineau, is pedestrian-friendly. See a map of the Montreal Gay Village pedestrian zone. If there's a restaurant in the Montreal Gay Village, there's probably a patio to go with it. As soon as the pedestrian zone is set up, Sainte-Catherine Street bars and restaurants unleash their patios. If you love to people watch, you can find more than 60 patios in the area. A few establishments are not to be missed. Check out Le Saloon Bistro Bar. The waiters are adorable, the vibe is fun and loud, and it mixes some of the best cocktails in the village. Another best bet is Le Resto du Village, which sells one of Montreal's best poutines. It's open 24 hours and you can bring your own booze. In fact, you better bring your own booze—they don't sell any. Just north of the car-free zone is Grenade, where creative cocktails, reasonable drink prices, and Asian street food are de rigueur. Part and parcel of the Montreal Gay Village car-free experience is open-air shopping. The village holds a sidewalk sale (aka "vente trottoir") three times in summer 2018: June 4–10, July 9–15, and August 27–September 2. All along the village's pedestrian zone on Sainte-Catherine Street, you will find merchants selling their products in front of their stores. This is a great opportunity to add new pieces to your wardrobe. August 15: "The Danish Girl"
For five days, the Montreal Gay Village turns into an open-air art gallery featuring one kilometer of artwork by more than 170 artists across several city blocks of the pedestrian zone. In 2018, Mtl en Arts runs June 27 through July 1. More than 200,000 people will attend and get the chance to meet the artists and buy original artwork. Expect live performances as well as live and even interactive art creation to be thrown into the mix. Held from August 9 to 19, Montreal's Pride Week features family activities, cabaret performances, club nights, conferences, and free events. Pride Week culminates in the city's one and only Pride Parade on August 19. Naturally, the Montreal Gay Village serves as a hub.